After a month of living in the Netherlands, with a Sunday off stretched in front of me, I sat down to a bagel based brunch, Earl Grey in hand, to ponder the topic of my first blog post as an Amsterdammer. I thought about the things that have stuck out about my time here thus far, the things that amazed me when I first arrived. 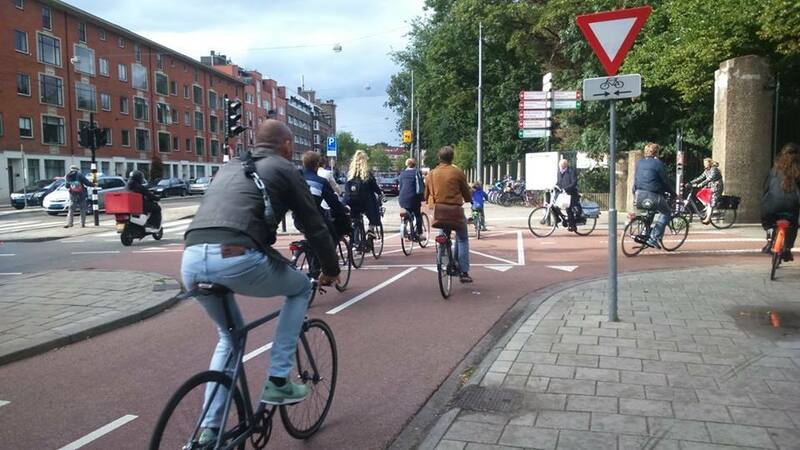 While I thought about a great many things, there was only one group deemed worthy of first post fame, and that group, my dear friends, is the cyclists of Amsterdam. While bikes remain a great symbol of the Netherlands, I never truly appreciated what a lifeline they are to residents of the city, young and old. 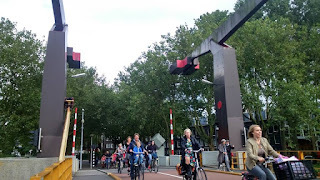 Yes, they are an impressive sight en masse, standing row upon row outside Centraal Station or chained decoratively to the bridges which span the canal, but, more than that, they are what connects the lives of every Amsterdammer. Home with work, work to play, person to person. Its not only a mode of transport but a way of life. Four lanes converge here and the result to the untrained pedestrian eye seems sure to result in confusion, terror and, ultimately, carnage. While there are, admittedly, a few 'bike rage' altercations and the odd near miss, the whole operation runs fairly smoothly thanks to the cyclist's unwritten code, unknown to us mere two legged mortals. If you are ignorant enough to be HALLO-ed, don't be disheartened. Once you become more aware of the cyclist/pedestrian heirarchy, your observations of cyclists will become a source of great amusement and, often, amazement. The It Girl about town who rode past me in 6 inch heels with a Starbucks in one hand, her phone in the other, steering with her knees. The woman who continued to cycle valiantly on despite the raging temper tantrum her two year old was having in the child seat on the back of her bike. Steering straight when a child is kicking you repeatedly in the back is no mean feat. Every suit and tie wearing business man I have seen cycle past me in a mad rush, briefcase in basket. The man who installed a full on trailer on the back to his bike to transport his beloved pooch. The drunken revellers wobbling home singing loudly with passengers on the back screeching. Cycling is in the blood here in the Netherlands and the joy it brings people is infectious.I love nothing more than seeing the crowds cycle past the hotel where I work. Even sitting here in the care, the crisp autumn sun glinting on newly brown leaves, the day wouldn't seem half as magical without the couple cycling hand in hand past the window.